Advanced birthday wishes to you. Hope you have a ‘safe’ one! 🤣🤣🤣🤣🤣I laughed this one until my children thought that I had really lost my wits!!! What an enjoyable, fun read. I used to ride both English and Western saddles. I went to Red Rock Canyon on the outskirts of Vegas. The horses were not treated well. We took a ride on a trail not quite so high. From my perspective, looking down from a horse can be daunting. They are so tall! It’s good to try everything (well, some things), at least once. Yeah, this one was definitely not a “Woohoo, I can’t wait to do this all over again” kind of adventure. The only thing I couldn’t wait for was for this adventure to hurry up and be over. I must say, I’ve had more enjoyable birthdays at Legoland and the zoo…as an adult. Getting stepped on by a horse doesn’t sound overly enjoyable, either. Ouch! Oh wait, that would have just made this whole misadventure even more dangerous! Glad you survived. 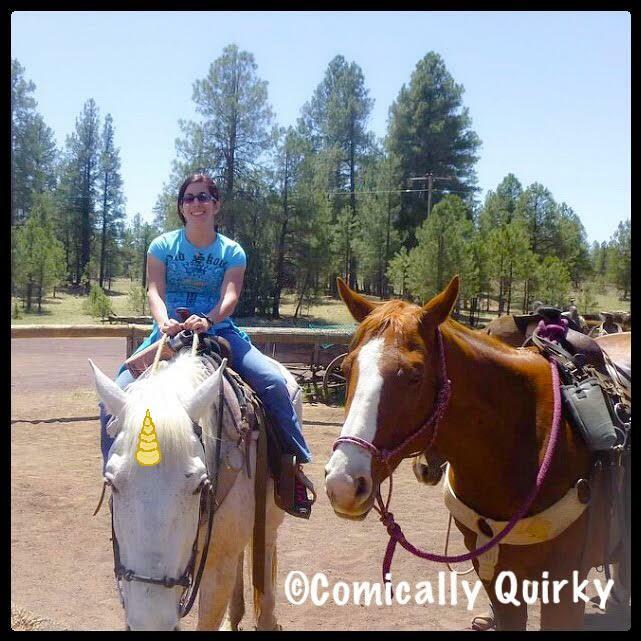 I rode a horse once…… and never again! Your horse adventure sounds like a story waiting to be told! Glad you survived your horsey birthday, and hope you have a very Happy and memorable-for-good-cause birthday this year!!! Oh my goodness what an adventure. I have always wanted to do that as well, but not sure if I could bring myself to do it. Maybe on a donkey or something like that…lol. Glad you made it through okay. At least you got a cute pic out of it, right? Maybe join a toastmasters group to practice your public speaking … you already have the talent, just build up your confidence. Happy Easter! I like horses from afar. Up close their giant teeth scare me. You were brave to even try riding one. Happy Horse-free Birthday to You. You’re right- they do have enormous teeth. Fortunately, that hadn’t crossed my mind at the time. Otherwise, it would’ve been one more thing for me to stress and obsess about. Marvelous essay. Happy Easter to you too.